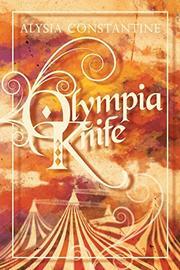 Born into a family of circus acrobats, Olympia Knife is unique in more ways than one. As she struggles to control her tendency toward literal invisibility, she must also navigate her burgeoning love for the newest star of the circus: Diamond the Danger Eater. Constantine’s (Sweet, 2016) second novel opens with the midact, midair disappearance of Alban and Julia, the Flying Knifes, as their young daughter watches from the trapeze platform. Olympia has been raised in the tightknit nucleus of the Stephens Great Attraction traveling circus, where her sporadic transparency blends in with the unique gifts of the fabulous Minnie the Fat Lady, Madame Barbue the Bearded Woman, Robin the Rubber Boy, and many others. As the book progresses, she is forced to confront the impermanence of even the closest of these relationships as, one by one, the members of her circus family begin to vanish into the ether. At the same time, Olympia finds herself falling in love with a mysterious newcomer—Diamond, who performs a dashing sword-swallowing act—and transforming her own identity into that of Nova the Half Man. As she struggles to navigate her unfamiliar emotions, her fluctuating visibility, and the unravelling of her livelihood when the circus grinds to a denuded halt, Olympia must thrust herself into the forefront of her life in order to preserve her own place within it. Though there is a tremendous amount happening in this novel, the similarity in the back stories of the characters, as well as a tendency to narrate even the most climactic of injuries, consummations, and murders in the same expository tone, renders the book hazy. The powerful central theme is similarly blurred by inconsistencies in the main characters' development (Olympia is both mousy and bold, Diamond both daring and prone to collapse in indecisive tears) and plot progression issues that find characters spending entire chapters rising from bed only to sink back into the same bed, exhausted, without much happening in between. A book that intends to balance on the fine wire of the exploitative-freak-show trope in order to render a point about inclusion and identity but succeeds instead in crafting a series of more-or-less familiar freak-show character sketches.